Sen. Ted Cruz (R., Texas) is seeking to fine the State Department for illegally withholding the release of a key report on Iranian human rights abuses that was supposed to be released earlier this year, but was withheld, according to sources, in order to appease Iran as negotiations over its nuclear program approach a June 30 deadline. "That report was due by law on February 25," Cruz told the Washington Free Beacon in an interview. "The Obama State Department simply ignored the law. They refused to produce the report. Months have gone by and they continue to refuse to produce the report." Angered by this delay, Cruz is gearing up to file legislation this week that would fine the State Department 5 percent of its budget for every 30 days it postpones releasing the report, according to a copy of the bill viewed by the Free Beacon. 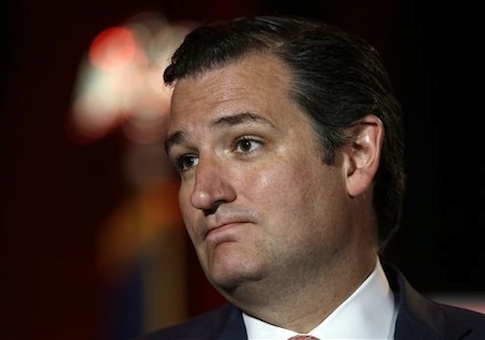 "It is a penalty for willfully violating federal law," Cruz explained. "This is also a policy decision that is profoundly counterproductive." "This simply puts a financial bite into the obligation because the Obama administration has demonstrated a willingness over and over again to violate federal law," Cruz added. Iran has long been a leading violator of human rights, carrying out hundreds of state-sanctioned executions and abusing the human rights of its citizens. Iran also continues to imprison several American citizens who human rights advocates report are being abused. Cruz said the report is likely being delayed in order to avoid upsetting the Iranians and potentially harming ongoing nuclear discussion. "It appears that both President Obama and Secretary of State Kerry are trying to sweep under the rug Iran’s horrific human rights record because, presumably, acknowledging that fact would be inconvenient" for the ongoing diplomacy with Iran, Cruz said. The policy, he added, appears to be "surrender everything to the Iranian mullahs in a hope they will accede to a [nuclear deal that only accelerates their acquiring nuclear weapons." The lawmaker and current presidential candidate went on to accuse the administration of ignoring Iranian human rights abuses. "This administration has consistently refused to address the human rights violations" committed by Iran, including the imprisonment of Americans such as Saeed Abedini and Washington Post reporter Jason Rezaian, Cruz said. "The Obama administration seems more focused on swilling Chardonnay with Iranian despots then on securing the release of American citizens wrongly imprisoned," he said. In a June 9 letter to Cruz, the State Department claimed the report’s release had been delayed due to Kerry’s intense travel schedule and need to present the report in person. "The secretary’s participation in the report rollout, even if it must be delayed by his travel, elevates the report," the State Department said, according to a copy of the letter. "The secretary has needed to travel abroad for extended periods, often on short notice, during the past three months to address a variety of pressing foreign policy concerns." "We intend to release the report as soon as possible and will keep you informed," the letter states. Cruz criticized the State Department’s response. "It has been 115 days since the expiration of the statutory deadline" to release the report, he said. "Secretary Kerry has not been on the road continuously for 115 days." Kerry, though recently injured and still recovering, phoned in via video link to the State Department’s daily briefing on Tuesday. He did not use to the opportunity to present the Iran report, sources pointed out. A State Department official would not comment on record about when the report would finally be released. This entry was posted in Politics and tagged Iran, State Department, Ted Cruz. Bookmark the permalink.